Bistro Kitchen: when your kitchen gets the center of your home. When I met Vlad the first time, in the apartment which he just bought and was eager to move in, we discussed about the dining room: Vlad wanted a certain room for a guest room, being able to have friends over for the weekend. I proposed to make it in to the dining room.... I couldn't convince him. But I could convince him to make a lost corner in his kitchen in a bistro corner. Funny thing: when I met Vlad, a few months after finishing the project, he told me he started to cook and when his friends came over, they preferred to stay in the kitchen. The kitchen is not big and the strange shape didn't make it easy to make it in a real practical kitchen. All the electricity, gas pipe and the water pipes were on one wall. We decided to keep them there to avoid to do major works in the kitchen. The fridge would be moved into the very small pantry. The strange corner was a bit a lost corner till I came with the idea to give the kitchen a bistro touch. The ceramic tiles which were on the floor were taken out and replaced by a travertine stone to give it a more natural look. The oranges tiles were the only thing we kept in the whole apartment as it would just give the perfect and colourful touch to the kitchen. So lets see how I turned it in to a bistro kitchen: the wall behind the bench, which was made specially on mesure to fit the place, would define the look of the kitchen, would be the center point of the room. One day I was walking in the center of Bucharest and at that time they still had the small stands, with all the antique books, along the street and I saw all those old music scores ..... that it was. They were old, got a nice yellowish patina which you can only get in time and they were really used, some hand written notes were added in pencil. It was the perfect background to add later all the pictures. All the pipes, which were running up the walls and around ceiling, had to stay exposed, they got finished with a bronze paint and got part of the decoration in the kitchen. Sometimes it is better to give some accent to an ugly detail than trying to hide it. 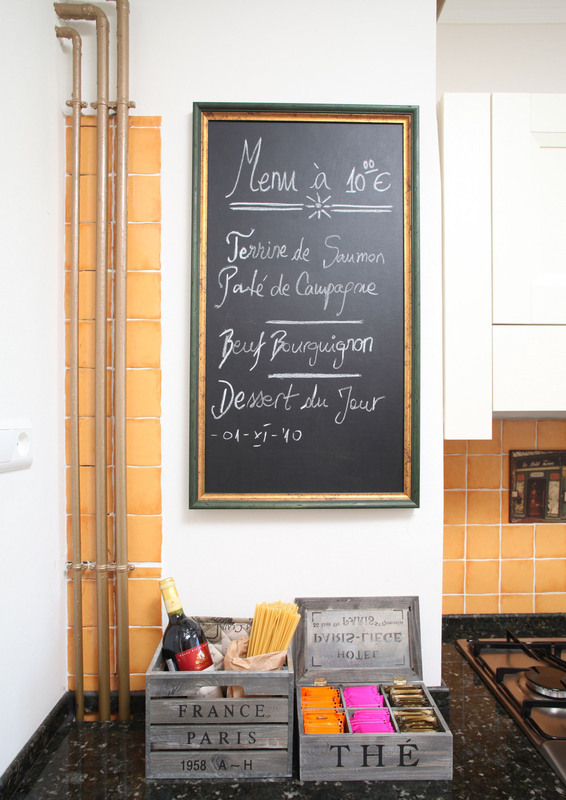 And a chalkboard fits in every kitchen; to make notes, a shopping list, or for the kids to make drawings when you are cooking. When I think of a bistro I think of Paris, the small places where at noon you will meet all the people working or living in the neighbourhood. They are all very personal, got their look over the years by adding more and more decoration. Start with looking for the wall decoration: if music is maybe not your thing you can create the same look with pages out of old books, or look for a wallpaper. Lewis and Wood has some perfect designs for that: the Calligraphy paper here under is just one of them. Afterwards you can start playing: add some great chalkboards in different shapes, add a nice collection of plates, some prints, pictures, a clock...... even a big mirror would look great. Those old fashion looking pendant lamps are perfect to hang above the table, they are in metal or glass, they come in different colours, shapes and often with interesting details. A bistro in general is so small that all the tables are nicely put in a row. They pull out a small table so you can slip in and sit on the bench. Go for some chairs with this real French bistro look, they don't have to be all the same, you can mix and it will add character to the place. It is all in the details, your kitchen can be simple, in a white or ivory color and than you add a touch of colour. This can be by using colourful tiles, it can be the toaster, some ceramic pots. Specially when the kitchen is small it has to be even more practical, some rods fixed on the wall to keep all your kitchen utilities. Perfect when cooking: it is all just in front of you. It is the dream of every cook to have the perfect pots and pans, a beautiful cooker with an professional look. And you don't have to hide those pots, they can be a part of the decoration. We all know the white metro tiles, they look great in every kitchen going from the industrial style to the country style. Why not to play with them: they come now in lovely colours, and in case you are afraid of to much colour in your kitchen than you can play with the different sizes or put them vertical instead of horizontal. We often forget about the switchers and sockets, we take simple ones, but it are those small details which make the difference. So you are ready to start designing and decorating your kitchen? and your kitchen will be the center of your home to get together around the table with family and friends. So maybe Vlad was right: who needs a dining room? !